The heavens are ripe with the opportunity to look at our stories. And that is very exciting. Stories create our realities. They are important, the small stories and the large. However, the square between Saturn and Neptune (exact this week for the first of three times during the next year), with significant assist from Jupiter, presents us with the opportunity to reframe the stories that seem intractable, absolute, immoveable. Those stories about the way things are and the way they have to be—those are the stories we can look at and change right now. We find ourselves in an incredibly complex world trying to discern the best way to go forward, create solutions, live with compassion, practice self-care, be in good relationship… It’s hard, right? Yep, and perhaps we are now undergoing an initiation into letting go of that story of hardship and worry. Perhaps, complexity and discernment do not have to be hard. Perhaps we are meant to incorporate greater and greater complexity into awareness and to simplify discernment to the point that it is obvious how we should treat ourselves and others (and by others, I mean everything, the world and all beings.) Perhaps, stranded in our DNA is a memory of when we knew how to do this already. My code words for this moment in history are complexity and discernment, which are qualities emphasized by those planets in mutable signs that are squaring off to provoke a change in our stories. Because I invoke these words so often, I thought I would look up their roots. I found a fascinating story. Complexity. The word, complex comes from Latin complexus meaning surrounding, encompassing. Also, complecti to encircle, embrace; from com – “with” + plectere “to weave, braid, twine.” Complexity is about weaving. Discernment. The word, discern comes from Old French - discerner “to distinguish, separate” (by sifting). Discernment is about sifting. Weaving and sifting are basic crafts of the housewife and the hedge witch. People began weaving and sifting early in human culture. We know this. Interestingly enough, both skills fit perfectly with Mercury-ruled signs Gemini and Virgo. (I am indebted to Lewis Hyde for his analysis of the trickster connection to crafts of all types. ) Both of these signs play a significant role in this month’s story. The Full Moon on November 25 is in Gemini, and Jupiter has been in Virgo since August. The small cycle of this lunation, which began on November 11* and the large cycle of Jupiter in Virgo (till September 2016) contribute to the possibility of remembering how to discern our way through complex times. A series of transits this week provides an opportunity to look at our stories and assumptions. 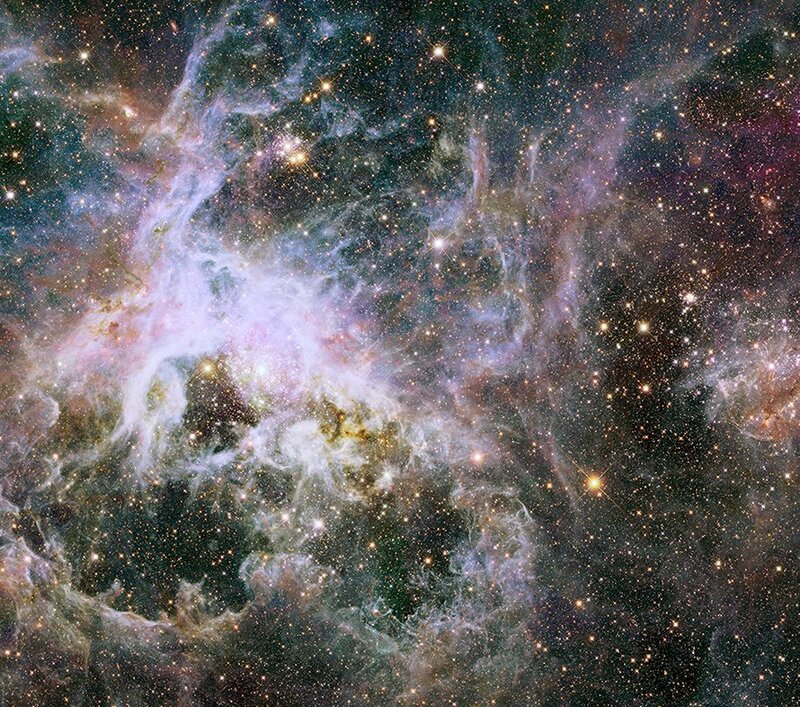 The prime directive is to not let the complexity derail us. Complexity is good. We want to weave more and more into our stories. We want Syrian refugees to live in our neighborhoods. We want racial justice and an end to privilege. We want reverent relationship with the Earth. (Or at least, I do. How about you?) Mercury in Sagittarius (mutable fire) conjoins Saturn and squares Neptune in Pisces (mutable water) on Tuesday and Wednesday. The Full Moon in Gemini on Wednesday gives this Mercury a boost. We want illumination. The square between Saturn in Sagittarius and Neptune perfects on Thursday, presenting us with the challenge of dispelling illusions in favor of productive stories. The Sun in Sagittarius will join Saturn and square Neptune on Sunday, adding even more illumination to this important task. We may feel as if we are caught up in communal dreams. Using the language of dreamtime may help us communicate better during this heavily mutable week. This lunar cycle began in Scorpio. We’ve been diving deep into soulful waters. Do not hurry to shake off that experience. We need the wisdom received during the Scorpio season to begin new stories. Monday, November 23. The Moon in Taurus (fixed earth) sets the tone for what we want from the rest of the day’s transits—stability. The most disruptive element of the day, Venus in Libra (cardinal air) opposing Uranus in Aries (cardinal fire) represents the ways that our relationships and alliances are being stretched. It is hard to maintain false harmony when so much injustice pervades. The Taurean Moon may contribute to a stubborn stance. The way around this is to acknowledge how scary change can be. Venus also makes a quincunx aspect to Chiron in Pisces (mutable water). This aspect may elevate our insecurities due to feeling vulnerable or exposed emotionally. Late in the day, Mars in Libra makes a favorable aspect to Saturn in Sagittarius (mutable fire). A new framework, a new course of action helps us to achieve the stability we yearn for. Tuesday, November 24. Notice the messages coming from those who want to influence you. In a week when the stories we tell and the stories we believe are so influential, take the opportunity to investigate the motivations of the storytellers. Mars in Libra (cardinal air) forms a quincunx aspect with Neptune in Pisces (mutable water). Some may want to lead us towards peace while others want to move us closer to war. How do the stories surrounding these desires influence us? Mercury in Sagittarius (mutable fire) conjoins Saturn and squares Neptune in Pisces (mutable water) in the middle of the night. Notice how important the messages seem. The struggle to communicate both concretely and poetically is worthwhile. Seek the unifying story that dispels illusion and grounds you in possibility. 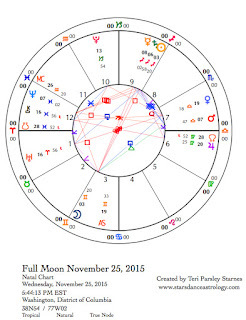 November 25—Full Moon: Illuminating. This lunar cycle began in Scorpio and has transitioned into Sagittarius influence with the Sun’s ingress into that sign. Seasonally, Scorpio is the time we move through the dying season. We become sensitive to the world beyond the veils. We seek and receive wisdom from that world. Sagittarian time is the season of celebration, telling stories around the fire, turning philosophical from our inner journeys. If we fail to invite complexity to our stories, we tell fundamentalist stories that don’t reflect reality. The opportunity at this Full Moon is to remember the wisdom from the unseen world and open to weaving into our realities greater and greater complexity. Mutable signs are highly emphasized in the chart for the Full Moon. All the mutable signs are represented. These signs govern how we collect, interpret, and disseminate information. All the mutable signs seek greater understanding. They also are the shapeshifters and adapters. Form is tricky. Reality is fluid. Although this energy can be liberating, it can also agitate those who have a hard time finding their own ground. Take extra care to find quiet spaces if you tend to get over-stimulated. The Moon in Gemini (mutable air) seeks the wisdom of pure thought. The Moon opposes Saturn and the Sun in Sagittarius (mutable fire) who are seeking the wisdom of pure energy. We get a chance to see how seriously we take ourselves sometimes, and step into the innocence of curiosity and open-mindedness. Tomorrow, Saturn will square Neptune in Pisces (mutable water). Pisces seeks the wisdom of the heart. Saturn is about structure; Neptune about transcendence of structure. Both must co-exist. In the tension, illusion and fundamentalism need to be transformed. This square is very influential for the next year. In today’s chart, Mars in Libra (cardinal air) aspects both Saturn and Neptune. Mars often acts as a trigger if we don’t have anger under control. There may be spikes of anger and reaction when we feel frustrated about deeply held beliefs that feel threatened. Although not in aspect with the other mutable planets of the chart, Jupiter in Virgo (mutable earth) seeks the wisdom of pure pragmatism. In a complex world, Virgo makes sense of the details by sifting through them to discern what is necessary and what isn’t. Remember this ally when complexity seems overwhelming. Thursday, November 26. U.S. Thanksgiving. Family gatherings can be tricky. Many in the U.S. are gathering to celebrate Thanksgiving today. Yesterday’s forecast applies to today too. Over-stimulation can lead to feeling unfocused, confused, or angry. Perhaps we need to simplify our expectations so we can enjoy the inquisitive and social energy of this day instead. The first of three squares between Saturn in Sagittarius (mutable fire) and Neptune in Pisces (mutable water) occurs today. The others will be in June and September of next year. We yearn is to understand why things are the way they are. There are stories that create illusion and keep us stuck and there are stories that encourage us to see the world as it is. As you tell your stories and listen to the stories of others around your thanksgiving table, be curious about the stories that create vitality and beauty. Friday, November 27. Awash in feelings after what could be a stressful week, the Moon moving into Cancer (cardinal water) alongside the direct station of Chiron in Pisces (mutable water) today means we need to take care of ourselves. Don’t feel guilty about pampering yourself. You may notice the urge to tend to others too. Pull your loved ones in close. Saturday, November 28. It isn’t exact but close enough. A grand cardinal cross aspect pattern provokes and stresses the status quo today. The Moon in Cancer (cardinal water) will square Mars in Libra (cardinal air), oppose Pluto in Capricorn (cardinal earth), and square Uranus in Aries (cardinal fire) today. This could be a tinderbox kind of day where the littlest thing sets off a chain reaction. When in doubt, follow the Moon, is what I always say. This means pay attention to emotions, yours and others. Most likely we just want comfort and security. Defensiveness means we don’t think others are honoring our needs. Let’s try to be extra compassionate. 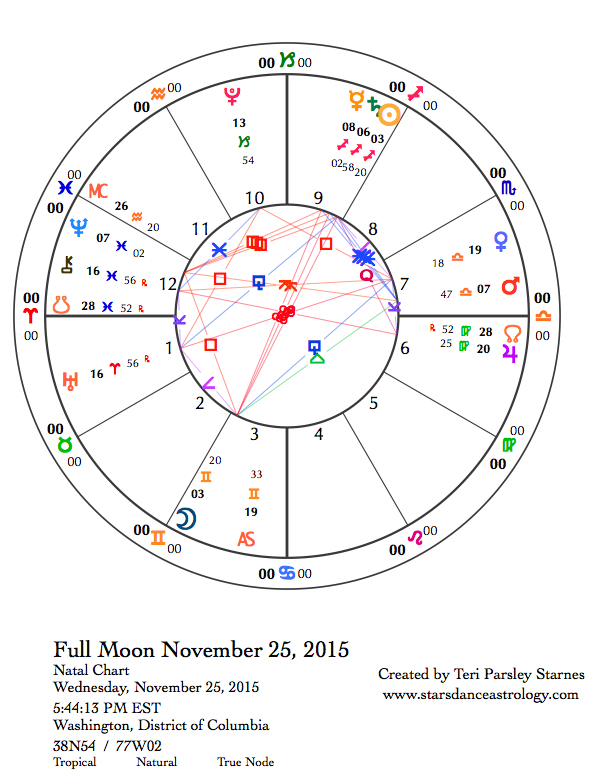 November 29—Disseminating Moon: Sharing. Earlier this week, we experienced the first of three squares between Saturn and Neptune. Today the Sun conjoins Saturn in Sagittarius (mutable fire) and squares Neptune in Pisces (mutable water) bringing a sense of illumination to this influential transit. My favorite astrological game is to notice which random events of the day could be symbolized by current transits. Possibilities range from minutia to significant world events. Saturn possibilities are: structures, bones, foundations, aspirations, lessons, limitations, old people. Neptune possibilities are: oceans, feelings, spirituality, addictions, popular trends in fashion, charismatic people. Somewhere today, the Sun will point out how we are experiencing these two planets in conflict. I’ve been thinking that the square between Saturn and Neptune provides us with a perfect opportunity to dispel stories that are untrue, limiting, or destructive. We need to be fluid enough to change and structured enough to stand for something. It is a challenge, but also a fantastic opportunity for insight and transformation. In this phase of the Moon, we are ready to share the gifts and experiences of the lunar cycle. What have you learned? How can you pass it along? The Moon in Leo (fixed fire) emphasizes the solar aspects of this day. Each of us has a light to give to others. Pass it along.